Sooner or later we all find ourselves in a situation in which we lose our innocence. Some people seem to glide effortlessly through this, remaining unaffected. Some chose to stay ignorant. Others feel shattered to the core when they realize how brutal the world can be and hurt that things were hidden from them. Some runaway, hide, shout and/or break things. A select few rise to action to try to fix the things that they don't like about the world. I think I have done all of these things in different situations! There have been points in my life when I felt so overwhelmed that I just couldn't process or deal with things. Then I learned that it's okay to break down every once in awhile. Becoming aware of things can be intense, especially for emotional people. Sometimes it can feel a bit hopeless. Still yet, I feel like it is so much better to learn what is going on in the world and in my own life, the good and the bad. The more I try to learn the more I realize that I will continue to be the naive one in many circumstances because there are so many things to learn and knowledge itself is always changing and growing. But having an open mind and a lot of patience is all you ever really need to show you care. Growing pains hurt no matter how old you are but if you deal with them gracefully they will make you a better person in the end. Hope that you are all having a great start to your week! These Kaftans are the coolest I've ever seen. They are like fancy witches' robes. I don't think I could ever justify spending such a large amount on a dress, but if for some reason you can, you can buy them at Royal Rickshaw. Maybe I'll get some silk chiffon and try to make my own if I ever have a reason the wear something so fancy. Uniqlo's playful yet practical clothing is a welcomed addition to any wardrobe. There are so many pieces that I adore on the website which makes it hard to chose. Sometimes it really helps to try things on, especially if it is a new cut or color. Since I don't plan on moving to Cali anytime soon I think it's about time that Portland gets a Uniqlo. I'm so sure that it would go over well here. I'm hoping that someone is already working on this! H&M is a huge success here and Uniqlo is pretty much the Japanese version of it. What could go wrong? Summer is right around the corner. Welcome it with open arms by wearing sunny and bright colors. Bring on the sunshine! Pretty pastels are the perfect thing to wear on a happy day. It's hard to be sad when you're this adorable. Navy is the new black again. It is slightly less hot and nearly as neutral. I like to mix it with black so I don't look too goth. Here are a bunch of different options. If your lucky enough to live near a Uniqlo, enjoy it for me! When I do get the chance to visit one I'm pretty sure I will just freeze for a moment to admire the perfectly organized stacks of clothing, before I actually start shopping. So. Cool. I see people carrying reusable grocery bags a lot. 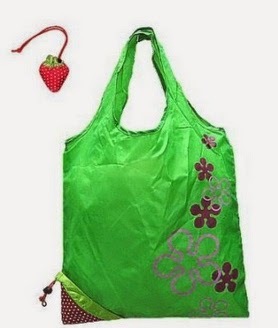 It is nice that more people are caring about the environment, but I don't get why so many of the bags are so ugly. I mean, would you use a handbag or wear a t-shirt that is bright blue with the word Walmart emblazoned on it? I get it. 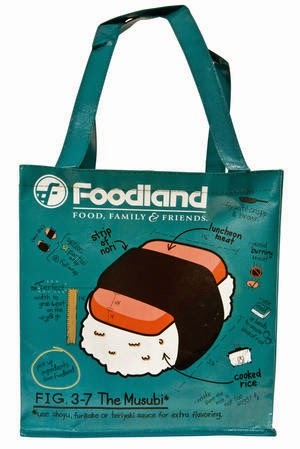 You went to the store and bought the bag out of convenience. Maybe they were charging you 5 cents extra a bag and you thought you'd try to avoid the fee in the future. Maybe plastic bags are illegal in your area and you forgot your bag that day and had to buy one. Still, there are ways around this. My favorite bag that I have is the spam bag above. I've had it for about 5 years and it doesn't seem to have worn out at all. Plus, it has yummy pictures on it. It is not just a mundane advertisement for the store. 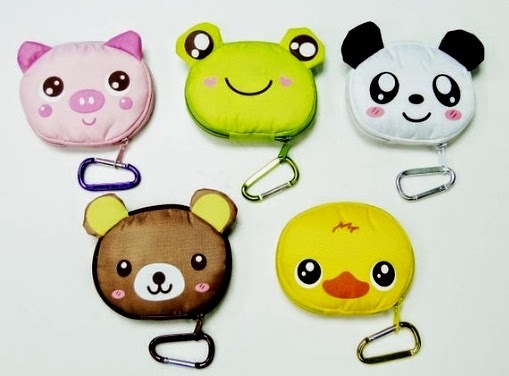 You can attach one of these cute little guys to your handbag, so if you're the type to forget your bag, it is always with you. I don't think they are made for heavy duty shopping, but they are perfect for when you drop by the drugstore for some odds and ends. 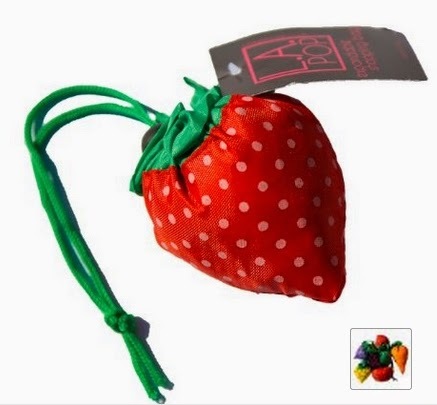 This strawberry bag is so cute! It comes with a whole collection of other fruit bags. Or you can go for an inexpensive version. No excuse to not carry a more personal bag! If you're looking for something a bit more personalized, try Zazzle. So many prints to choose from! 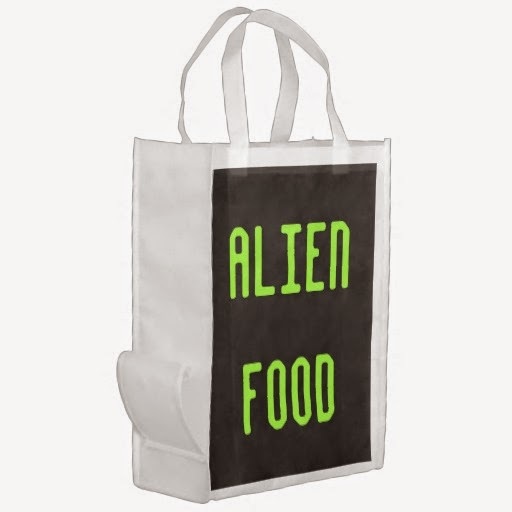 I like this Alien Food one - I'm not sure if it implies that the carrier is an alien, or if they have a pet alien. When I got my Spring H&M catalog I just about squealed when I noticed that a few of their looks contained moth print fabric. I love butterflies, but moths are so unexpected and just as beautiful. These pieces are mostly in my dreams, with lots of expensive jewelry to boot. The awesome Antipodium Propagator skirt is sold out but it is just too perfect. I love the cut, length and flow. The blush lace Dorothy Perkins dress is only $55 retail but unfortunately it is also sold out. DP offers a similar dress available here but the cut isn't quite as curvy. The silk J Crew blouse is on sale right now for $80; the "sail turquoise" color is pretty much my favorite color at the moment! Though they are not as fancy, these looks are much more affordable and easier to take care of. The moth prints by various artists on society6.com are just beautiful. Seriously thinking of ordering the one with the mint moon by Morgan Kendall, I just need to figure out where to put it. The navy moth print pants above by h&m are the piece that started this whole ordeal. Since the moths are different colors they almost look like little eiffel towers from far away.